Production - Ensyn - Renewable Fuels and Chemicals from Non-Food Biomass. Ensyn’s three million gallon/year production plant in Renfrew, Ontario (“Ontario Facility”) is Ensyn’s first facility dedicated to the production of RFO. In addition to the Ontario Facility, Ensyn has built and commissioned over 15 production units incorporating its RTP conversion technology since 1989, including five commercial facilities in operation in Wisconsin producing specialty chemicals and heating fuels. The Ontario Facility has been in operation since 2006, focused primarily on production of liquids for chemicals and heating fuels. In addition, Ensyn has used the Ontario Facility to demonstrate and commercialize its biofuels business. 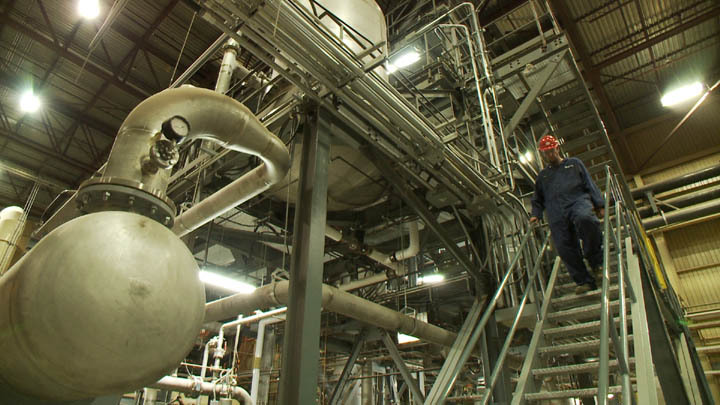 In 2014 Ensyn carried out capital improvements to the Ontario Facility, converting it to a dedicated fuels plant capable of producing three million gallons/year of RFO. The Ontario Facility enhancement was partially financed by a $1.5 million grant from Ontario’s Centre for Research and Innovation in the Bio-Economy (CRIBE), a provincial initiative to transform the forest products industry in Northern Ontario. To see a short video of the CRIBE award event in Renfrew, click here. Commercial production from the Ontario Facility is being directed to heating oil clients in the Northeastern US and in Quebec under term contracts. Capacity is also being reserved to develop new clients and to seed the market for new RFO production projects Ensyn and its partners are developing in the US, Canada and Brazil. Ensyn’s Renfrew facility has been qualified by the US Environmental Protection Agency (EPA) under the US Renewable Fuel Standards (RFS2) program. Sales of RFO from Renfrew to US heating clients are generating D7 RINs (Renewable Identification Numbers) under the US RFS2 Program, enhancing the value proposition of the US contracts. Ensyn’s patented RTP technology uses heat to thermally crack carbon-based feedstocks into high yields of a higher-value liquid product. Ensyn has numerous successful alliances with industry leaders.